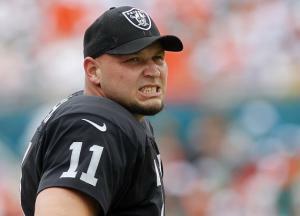 Sebastian Janikowski was born on the 2nd March 1978, in Wałbrzych, Poland, and is known to the world as an American Football player, the placekicker for the Oakland Raiders of the National Football League (NFL). Thanks to his skills, Sebastian has earned a nickname The Polish Cannon, having one of the strongest kicks in the history of the league. Have you ever wondered how rich Sebastian Janikowski is, as of mid-2016? According to authoritative sources, it has been estimated that Sebastian`s net worth is as high as $14 million, an amount he has earned through his successful career as a football player; his salary is $4.75 million. Sebastian`s father Henryk moved to USA in the 1980s, when Sebastian was a child, as he was a soccer player, and went to USA in search of a contact, and also a better life. Meantime, Sebastian was good enough at soccer to play for Polish Under-17 team when he was 15 years old. His parents divorced after a few years, and his father married an American citizen, which enabled Sebastian to move to the USA. When he moved to the USA, he settled with his father and stepmother, and attended Orangewood Christian School, playing for their soccer team, and thanks to his skills, he also joined the Orlando Lions, which was an under-19 team. Soon after, recommended by his coach, Angelo Rossi, Sebastian transferred from Orangewood Christian School to Seabreeze High School, where he continued his soccer career, but became interested in American Football too, as a place kicker, to the extent where he earned USA Today High School All-American Honors in 1996, and also won two Lou Groza Awards, in 1998 and 1999. Thanks to his great performance in high school, Sebastian received scholarships to prestigious universities, and in the end selected Florida State University. While there, he continued successfully his playing career, winning two Lou Groza Awards, in 1998 and 1999, and he was also named Consensus All-American twice, in 1998 and 1999. He forewent his senior year, and declared for the 2000 NFL Draft, in which he was selected by the Oakland Raiders as the 17th pick overall, which marked the beginning of his professional career, and real start of his net worth.He has been playing for the Raiders since then, and during his career, he has set various records – he is the Raiders all-time leading scorer, with 385 successful field goals out of 480 attempted, and other records include the longest field goal kicked in overtime at 57 yards, most field goals in one quarter – four, most field goals of 50 yards or more in one game with three, and most field goals of 60+ yards in a career with two. He has won several prestigious awards, and recognitions, including one Pro-Bowl appearance in 2011, and was also selected for the Second-team All-Pro the same year. During his 17-season career, he subsequently signed three contract extensions which have only increased his net worth; in 2005 he signed a contract worth $10.5 million over 5 years, his next contract was in 2010, worth $16 million over four years, and his latest contract has been active since 2013, worth $19 million over five years. Thanks to these contracts, he became the highest-earning player on the position of placekicker in the history of the NFL. When it comes to speak about his personal life, Sebastian is married to Lori, with whom he has twin girls. Other facts about his life are unknown, although he is active on several social networks, including Twitter, where he has a great amount of followers.